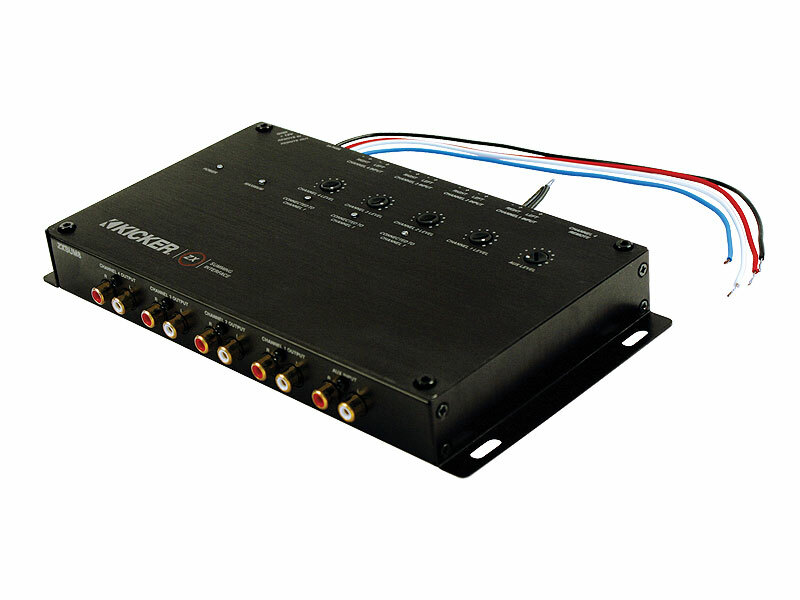 The KICKER® ZXSUM8™ Summing Interface provides complete integration of aftermarket audio products into a vehicle’s factory OE system, while adding a handy auxiliary-input jack for entertainment from portable media devices. The KICKER® ZXSUM8™ Summing Interface provides complete integration of aftermarket audio products into a vehicle’s factory OE system, while adding a handy auxiliary-input jack for entertainment from portable media devices. It assists in upgrading a stereo system by feeding KICKER Amplifiers a well-balanced meal of beefy full-range audio without having to replace the source unit. The interface features four stereo speaker-level inputs and four line-level stereo RCA outputs, and each stereo channel is internally capable of both summing and line-output conversion. Portable media devices such as iPods® or iPhones™ can be integrated into the mobile system with the addition of a stereo RCA aux-input. A convenient remote handles multiple functions of the ZXSUM8, including the control of aux-input level and Channel-4 output to separately adjust bass and auxiliary levels from the same remote source.